Sea kayaking with seakayakphoto.com: Sea kayak paddle sailing and tacking upwind. Sea kayak paddle sailing and tacking upwind. At the paddle sailing sessions at the recent Flat Water Symposium many people were surprised that it was possible to make progress to windward. I have previously asked the question "is it worth tacking upwind with a Flat Earth kayak sail?" At that time I thought that it was not, especially in lighter winds. I would like to revisit this question considering stronger winds and the use of recent forward fin developments. 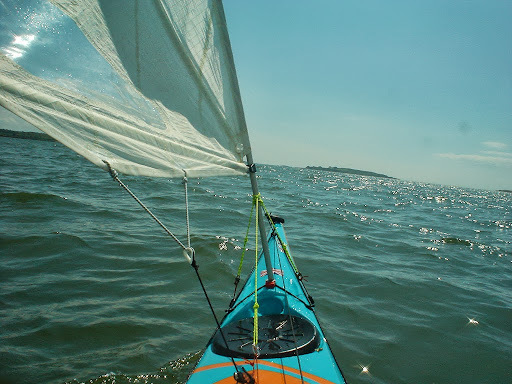 In a long unmodified kayak, such as a Cetus (photo above), Taran 16 or Nordkapp LV, I have found that it is possible to paddle sail to about 45 degrees to the wind which is much the same as a dinghy like a Laser. 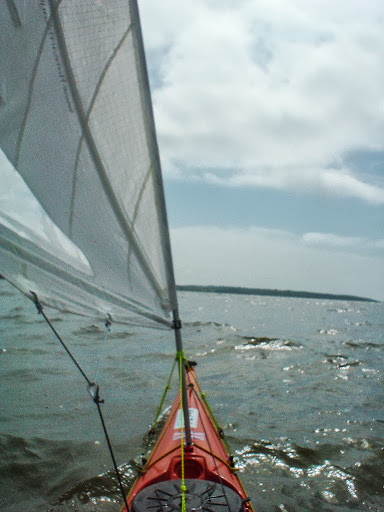 In shorter kayaks such as the P&H Aries (phopto above) the kayak can still beat upwind but it points about 15 degrees less high i.e. about 60 degrees to the wind. Geoff Turner from Kari-tek and Graham Mackereth from P&H have each developed forward fins ("ventral fin" and "forward board" respectively) to allow kayaks such as the Aries to point higher. 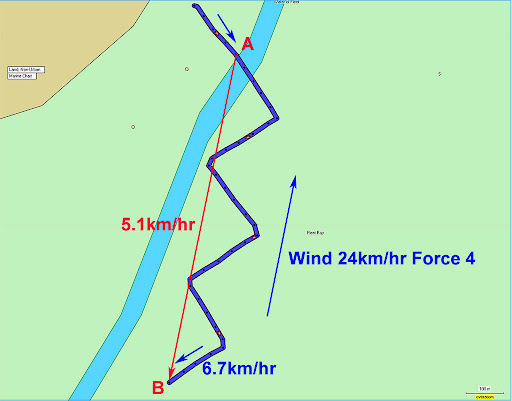 I have carried out a number of experiments using the GPS to measure the effectiveness paddle sailing upwind in F4 and the effectiveness of the forward skeg and when best to use it. This shows an Aries fitted with a forward fin in the fully down position and the rear skeg in the fully up position tacking 1km upwind from point A to point B. The wind was Force 4 with a fetch of about 50 km and there were short steep waves. I used Garmin Mapsource program to analyse the data from my GPS tracklog. The first thing to notice is that the angle between each tack is about 90 degrees which means that the Aries is now sailing about 45 degrees to the wind. The speed through the water was 6.7km/hr and the velocity from point A to point B was 5.1 km/hr. In those wind and waves just paddling (without the sail) in a direct line from A to B my speed was 4.9 km/hr. In lighter winds I could have paddled the Aries about 7-8 km/hr into the wind and so it would not have been worth hoisting the sail and tacking. This experiment (and others I have done) shows that in a good F4 on open water, tacking upwind with a sail is marginally faster than just getting your head down and paddling directly into the wind and waves. What the figures don't show is how much more fun paddle sailing is. Also in this experiment I lost speed each time I tacked (which was 5 times). I could have gone from A to B using two longer legs and only 1 tack which would have further increased my speed. I am an avid FEKS user (and sell them in the US) and can attest to your findings. But I have to add--you can't stop paddling, and paddling hard to contribute to that forward movement!